Published: Dec. 13, 2018 at 11:36 p.m. Published: Dec. 2, 2018 at 09:00 p.m. Published: Dec. 31, 2017 at 06:51 p.m.
Los Angeles Chargers quarterback Philip Rivers fires a deep pass to wide receiver Travis Benjamin for 62-yard TD. 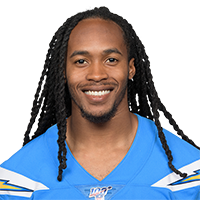 Published: Dec. 10, 2017 at 07:03 p.m.
Los Angeles Chargers wide receiver Travis Benjamin returns the punt for 47 yards.